If you are looking for a truly complete forced induction solution for your FRS/BRZ/86 then you have come to the right place! Welcome to the newly revised JDL Auto Design V2 Turbo system. It's compact and simple to install design makes it easy for the DIY individual with basic hand tools to participate in the gratification one gets from modifying their vehicle. The JDL Auto Design Turbo system is the answer everyone expresses about the twin platforms OEM power levels. Simply push the GO GO pedal and effortlessly the nimble chassis accelerates with ample eagerness. Nothing says you mean business more than the sight of that pronounced intercooler sitting behind the grill like a caged animal ready to attack. Just add a tune to any of our many variations and your car will take on a whole new attitude! If you do not already have a tuning solution we have you covered there too. Just let us know what we can do to assist you in reaching your performance goals by giving us a call. No matter the power goals we have you covered! *** We highly recommend calling us (FREE) for a full overview and to find your specific needs! - Ideal for everyday conditions on stock block. - Faster Spool time compared to GT version. - Recommended for those seeking higher boost levels. - Not ideal for stock block. - For those looking for max gains possible. - 3 bar sensor is most recommended by tuners. - 4 option available if your tuner recommended 4 bar vs 3 bar. - Not required , but makes it look cool and be cool. ** There are multiple color options for thermal coating. If you have a special request contact us. *** you can request your IC to be a different color (black) and the pipe to be red for example - Just mention the specs in the notes upon check out. - Open dump is the standard version. - Open dump has a decreased spool time vs recirculated option. - Recirculated option is quite and more manageable for daily driving. - Open dump requires you to cut a part of your skid plate for dump tube. - 2.5 standard for everything stock to aftermarket. - If you have a custom 3in overpipe select this option. A. Removal of front crash bar. B. Cut/modify current crash bar to work with inter-cooler piping. C. Purchase aftermarket "Drift Bar"
- No Cut option will route intercooler piping around meaning no cutting required. 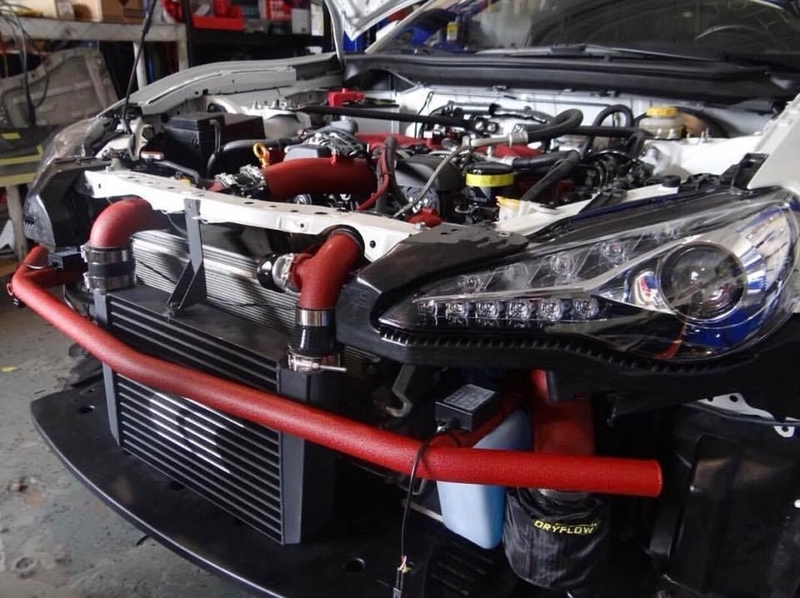 All manifolds, hot part kits, custom intercooler kits, and full turbo kits are built upon order unless otherwise stated items are in stock. Please allow 4-6 weeks for completion of said parts. Build times are also subject to change without notice depending on current workload. If you have any questions or would like to discuss custom options please do not hesitate to contact us. Pretty easy install, quality product with great looking thermal coating. UEL sounds great as well with my Invidia N1 and Tomei OP. My first review was rather short so I decided to provide a better one. First of all, the kit is extremely high quality. Everything fit great and the thermal coating was perfect without a scratch. The packaging was also great, however it was shipped with Fedex and don't get me started with how useless they are. The blow off sounds amazing and I encourage you to watch their video for it. In person it's way better although I haven't been able to experience it at more than 3.5k RPM due to tune delivery conflicts. My only issue was the lack of instruction and documentation provided, but even so the install only took me 1.5 days and it was my first FI install (and on jackstands lol). I used a mix between JDL's Turbo Manual for their old kit, the Greddy manual, and a few others along with Youtube. If you plan on ordering, expect at least 5 or more weeks until it ships, and then another week after that to arrive. The product arrived in two boxes coming out to 120 total I believe it was. Also, the stock front bumper bar will require modification so if you have the money I encourage you to buy the JDL Bumper Bar like I did. The wait is worth it, everything is made to order and again, super high quality. Also the blacked out inter cooler looks pretty sweet under the front grill. *Your kit was one of the first kits in the first group to be produced for the new design - longer lead times are expected on a new product release. Typical lead time is 3 weeks and as production gets smoother JDL will get better at hitting these marks, but with anything custom it will take time especially when there is high demand and on a first run. **Documentation has and now is being provided with each and every kit. It was easy to install, I did the install with just hand tools at home on jackstands. I’m loving this kit, definitely a quality product as always from guys over at JDL. Hawaii likes JDL haha, couple of us down here have it and we love it. No complaints. the kit is amazing, the top products of the range, I have yet to mount and already I'm excited. the only problem is the delivery time for abroad. the assistance team is very kind and ready.